Like the rest of us, the birds have been enjoying the gloriously sunny weather we’re having and DH has been having fun with his new video camera trying to capture some of them in motion. At the moment we only see our faithful year-round inhabitants, but soon now the summer visitors will begin to arrive and we will be able once again to marvel at their breathtaking aerobatics. 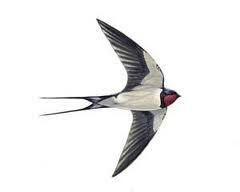 Yes, the migration season is upon us again and what applies to the birds is also true of the Transit household. Bags are being packed, the campervan given its spring-cleaning and in a couple of days we will be once more on the road north. The difference this time is that en route we shall be spending a couple of days in Southport for a family get-together to celebrate DH’s mother’s birthday. This will be great fun and in addition gives me my very first chance to meet a blogger in the flesh. The Broad lives in Southport and has kindly invited us to call in for a cuppa and a chat while we’re there, a meeting we are both looking forward to with keen anticipation. As if this weren’t enough excitement for two staid old-age pensioners on one trip, we have received a second invitation from a fellow-blogger. Sian has invited us to visit her on her small island while we’re in the far north of Scotland and we plan to do that before we finally head south again in early May. It will be such fun to put faces to the names and vice-versa and to be able to talk about the things we have previously only written and read about. I can’t wait! For now though, it’s back to the preparation and the packing, so if you don’t see me about in the blogosphere for a little while, that’s the reason. As regular readers will know, I’m a great believer in serendipity where inspiration for new posts is concerned. Being blessed with a veritable rag-bag of a memory, when something occurs to shake it up, almost anything is liable to fall out. This became very clear when I decided to include a song by Flanders and Swann in my last post and later read the comments I received. Suddenly my mind was full of half-remembered songs and the memories they evoked and one in particular refuses to go away. 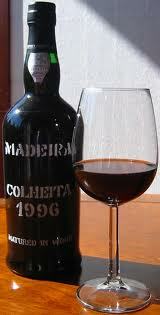 Growing up as I did in the Lancashire countryside in the days before cheap holidays in the sun, the first time I heard the word Madeira was in another comic song by Flanders and Swann. I gathered that it was a drink of some kind, but it was years before I realised that it was named after an Atlantic island and decades before I first tasted this heavy, sweet dessert wine. Through the years I continued to hear the name mentioned, usually by friends and family who had visited Madeira on holiday to enjoy its mild climate and famously prolific spring flowers. But it had never occurred to me to think of going there myself, until my next-to-youngest sister asked whether I would like to go with her sometime, since her own husband didn’t fancy it as a holiday destination and my DH flatly refuses to fly. Naturally I agreed instantly and we finally decided to make the trip to mark her retirement at the beginning of 2010. The week we chose was exactly 2 years ago this week, and having booked at a lovely small hotel in the old town, just back from the seafront, we spent the hard winter of 2009-2010 looking forward to our holiday in the sun with great anticipation. Unfortunately the weather had other ideas. That winter was bitterly cold in north-western Europe and the moist, warm westerlies which usually keep Britain reasonably frost-free most winters were pushed south by an influx of Arctic air and instead gave Madeira and southern Europe their wettest winter for many years. On February 20th 2010 this wet winter culminated for poor Madeira in its worst storm for 100 years, resulting in catastrophic mudslides and flooding in the capital Funchal and along the south coast. Even a minute or two of this news footage gives a deeply sobering picture of the damage inflicted, and at first my sister and I couldn't imagine how the island would possibly be able to welcome visitors like us, who were due to arrive just three weeks later. Many holiday-makers cancelled their trips, but we felt that if we could possibly go we should do so, since an island which relies on tourism for so much of its income would find it even harder to recover if all the tourists stayed away. So on a cloudy Monday afternoon we arrived in Funchal to the warmest of welcomes from our friendly hotel staff and, despite the less than seasonal weather (only one really sunny day) spent a wonderful week exploring this most fascinating of islands. With its volcanic topography of high mountains and precipitous hillsides and its luxuriant vegetation at lower levels, it is very beautiful and very different from anywhere I had been before. Funchal we both loved and we spent many hours exploring its compact centre on foot, walking on the striking black and white pavements and visiting a wonderful range of historic buildings (also largely black and white) from the Art Deco farmers' market to convents, churches and the town hall square. On our one gloriously sunny day we even braved the cable car (I don’t do heights) to go up to the little village of Monte, 2000’ (600m) above sea-level, where we could look down over the whole of the city and its lovely bay. Yes, I DID travel in one of these! Coach tours took us to the interior - to the hidden valley of the Curral das Freiras (Nuns’ Refuge) and to the spectacular sea cliff at Cabo Girão, one of the highest in the world, where we looked down 1900’ (508m) through the rain to the sea. We visited the picturesque fishing village of Câmara de Lobos, named not after wolves, as its name might suggest, but after the now critically-endangered monk seals which once crowded its beach. We also walked round the normally bustling little town of Ribeira Brava, which had been badly battered by the floods, but which, like Funchal itself, was working very hard to repair the damage. In the evenings we braved the blandishments of the restaurant staff in the Old Town, who tried hard to entice us to visit their establishment rather than the next, and enjoyed the local cuisine, with its emphasis on fish and beef, served in interesting ways and washed down with good Portuguese wine. We saw and photographed far too much to be included in a single post, but perhaps, if you've enjoyed this first little sip of Madeira, I may return to tempt you with another one day. Dealing with the growing list of Blogger glitches puts me forcibly in mind of a song which I've known and loved since childhood. It sums up to a T the feeling of being trapped in a vicious circle of incompetence, so I will leave you to enjoy the dulcet tones and biting wit of Messrs. Flanders and Swann, while I relax with a nice pot of tea. A fix, a fix, my kingdom for a fix! The fix below is no longer necessary as the Quick Edit tools have been restored as of the beginning of April. 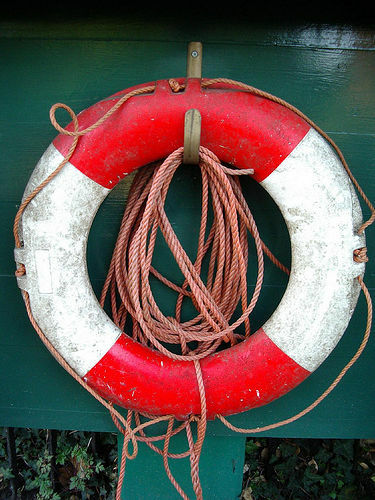 As I’m going to church this evening for a change, I've just spent much of the morning ploughing through the deeply user-unfriendly new version of the Blogger Help forums. But it was worth it, as I've found a fix for the new country-redirect system, which I bemoaned yesterday. One forum contributor said that the fix only lasts for as long as we have our browser open and that we would have to do it again every time the browser was re-opened, but that isn't proving true for me at the moment. In fact I have even closed down my computer and rebooted it and the fix is still working, though of course, this being Blogger, there is no guarantee that it will continue to do so indefinitely. Given that we all have different circles of followers, can I please strongly urge you either to do a post on this yourselves or to point people in the direction of this post, so as to spread the word as widely as possible. I’m more than happy for you to copy as much of yesterday’s post and this one as you need in order to do so, as there is no point in everyone reinventing the wheel. Fingers crossed that it continues to work…. 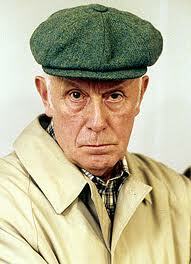 Only the irascible Victor Meldrew’s catchphrase, as uttered by the inimitable Richard Wilson, can sum up my incredulous frustration at Blogger’s latest spanner in the works. Or rather lack of spanner, as I’ve just noticed that the invaluable little wrench symbol, which allows me to edit all the gadgets in my sidebar from my front page, has disappeared without trace, as has the Quick Edit pencil icon below each post and the Delete button next to comments. This is the unintended and profoundly annoying side-effect of yet another change to Blogger, or rather to the blogspot URL where our blogs are hosted. Google is gradually changing the suffix of our blog addresses from the ubiquitous .com to co.uk for us Britons, .ca for all Canadian blogs, .au for Australia and so on. The reason for this is given here. I read some of the howls of anguish in the Blogger Help forum from the countries where the change has already happened, as they saw all their quick editing tools disappear at a stroke, and I pitied them. Now it’s Britain’s turn and I’m feeling seriously sorry for myself. Sadly I have no advice to give, no quick fix or workround to share. 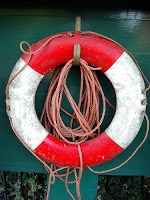 All I can do is to reassure my affected blogfriends that it’s not their fault and share their frustration at now having to go behind the scenes every time they want to tweak anything, however small. When Google will eventually sort out this new bug is anyone's guess, but given the number of recent problems, I'm not hopeful that it will be soon. Early yesterday morning, after a very bad night, I pootled sleepily across to read Debra’s latest post on her lovely blog breathelighter, as I drank my morning tea. 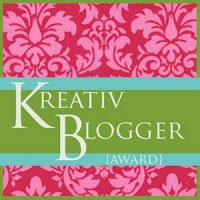 I always enjoy Debra’s take on life in the very different setting of Southern California, and was happily reading about her granddaughter’s sayings, when I almost dropped my mug as I found that she had nominated me for a blogging award I hadn’t heard of – the Kreativ Blogger. the creation of which is documented on a visually stunning Norwegian blog (which really makes me wish I could read Norwegian) to the one most commonly circulating at the moment. I also discovered that the updated version of this award asks that we pass it on to seven other bloggers, after posting seven interesting facts about ourselves. Hulda, however, was more modest in her original concept and only chose four. She also laid down no conditions for her recipients, simply explaining why she felt the blogs she had chosen qualified for the description ‘creative’. This is where I start to get creative and post the one interesting thing about myself I think is relevant, which is that I feel a little uncomfortable about the way Hulda’s unconditional mark of recognition now comes with conditions. To me an award should be something given because of who the recipient is and what they have already achieved, with no strings attached. So I’ve decided to revert to Hulda’s original intention and add her lovely design to my sidebar, as it seems a pity for it to fade into obscurity. In the same spirit of freedom I’m not going to place any conditions on my own recipients, leaving them to choose which version of the award they want to download, if any, and whether and how to pass it on in their turn. Baking in Franglais – a blog I practically have to give up for Lent. Jean is as passionate and creative about her craft of baking as she is about blogging and her baking blog is a feast for the eyes as well as the stomach. Her enthusiasm for good food is contagious and I can’t wait for Easter to try some of her wonderful recipes. Moving on Annie was an obvious choice, as she is always being creative with words, photos, yarn and chocolate, not necessarily all at the same time. J Annie and I go back a long way in my blogging life, as we found each other’s blogs only a few weeks after I pressed the publish button on my first post. It’s always fun when blogging friends share a hobby and knitting matters a lot to both of us, though living in the heat of southern Spain does make it more difficult for Annie to show off her creations. Janice in Caunes Janice is a newer blogging friend, who, like me, enjoys life in more than one country. 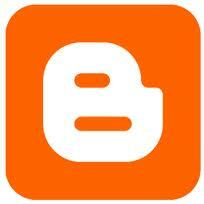 She is busy learning the craft of blogging and is rapidly discovering how fascinating and addictive it is. I have enjoyed watching her posts become more and more creative over the few months since I found her blog and shall equally enjoy watching her be creative with her beloved house in France, when she migrates south for the summer. 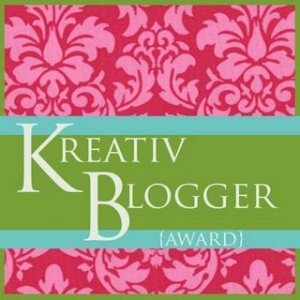 So there you have it: a few examples of creativity plucked from the maelstrom of creativity that is the blogosphere. I hope you enjoy them as much as I do. Recently my blogging friend Fly in the Web, of French Leave and Costa Rica Calling, sent me a lovely video clip of a robin which had set up its nest in a garden hanging basket. After watching this super little video it occurred to me that people might also enjoy the story told in the photographs below. Four years ago, in the middle of May, we took our trusty little campervan into our local market town for its annual MOT test (the compulsory British test of roadworthiness) only to get a bemused phone call from the garage soon after we arrived home. They had opened up the engine compartment to find a bird’s nest, complete with eggs, on top of the carburettor! They promised to complete the test without disturbing the nest and later that day we collected the van and drove it home very gently indeed. 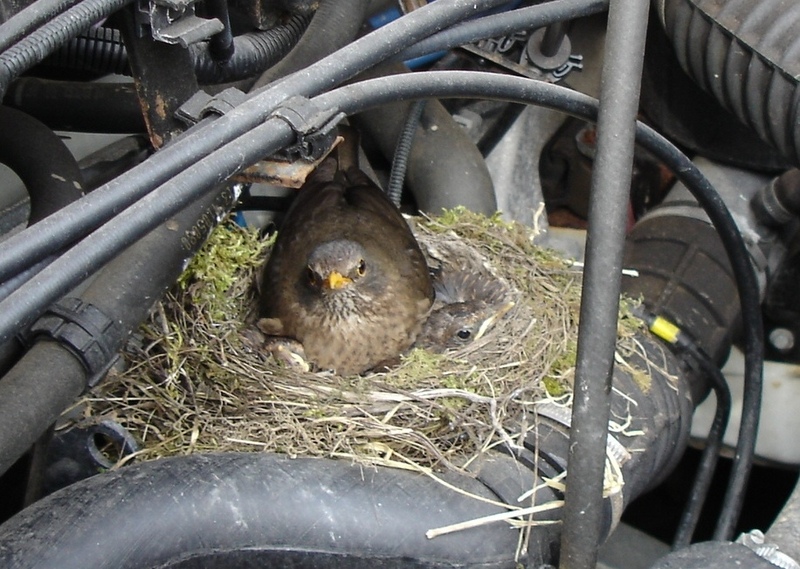 Amazingly, not only were the eggs undamaged by the heat and vibration of the engine, but the mother blackbird went back to her nest as soon as we got back and eventually hatched all her eggs. Over the next few weeks DH and I carefully peeped in from time to time to watch over the nest and the rapid progress of its precious contents. 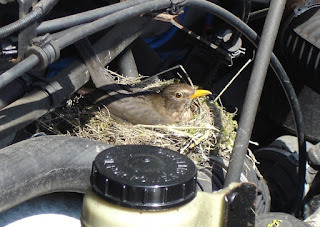 Obviously we couldn't use the van again until all the baby birds had grown up and left the nest and in fact it was touch and go as to whether they would leave in time for our scheduled trip to France. From memory the last of the fledglings finally made his entrance into the wider world little more than a week before we were due to travel. STOP PRESS! Apologies to my earlier visitors. The video I put in wasn't in fact the one Fly sent me. I inadvertently clicked on the wrong one in the YouTube list. Silly me! I have now added the correct one, so if you have popped back, you may like to watch again. If you want to see the photos enlarged, double-click on them and they will open in what Google calls a light-box, which really enhances the colour and detail. According to my old friend Dancing Beastie, spring is sprung. Another old friend, Sian, of Life on a Small Island, concurs with her opinion. Bear in mind that both these blogs hail from north of the Border and, very unusually, Scotland has on the whole had a much milder winter than the rest of the UK. When was the last time, I wonder, that daffodils came out earlier on Orkney than in the land of Saint David himself? But now it’s official. Here on the Welsh hilltop that the Transit family call home (that is, when they stop all this moving about) spring has finally arrived. There are primroses in the hedgerows up the hill from the village and even one or two in our very exposed back garden. The birds are working themselves into a frenzy of nest-building and even I, as you know, have been spring-cleaning. Best of all, for all of us who prefer light to darkness, the days are rapidly getting longer and today, according to the BBC weather page, sunset here won’t be until 6pm. Oh, we may still get snow if we’re unlucky, and certainly frost won’t disappear for months yet. Nevertheless, winter is over, new life is springing up everywhere and I think that calls for a little music, courtesy of a clip I was treated to recently on a new friend’s blog from Some Other Mountain. Thanks, Molly. 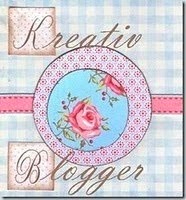 Sometimes it feels as if all I’ve been doing lately is grumble about Blogger and the changes that are being made to it. I’m not averse to change, truly I’m not, but only change for the better. Change for change’s sake, purely to get a new look without any improvement in function, just makes me cross. The latest little gem in the ongoing Blogger revamp came earlier this week, when the full-page and pop-up comment formats were changed without warning to the glossy (and barely legible) new Google look, all acres of white space and small, cramped, pale, difficult-to-read text, ornamented with tasteful orange highlights. What do you mean, don’t I like it? I could have lived, albeit grudgingly, with the new look if it hadn’t brought with it the loss of two invaluable functions – the ability to subscribe to receive later comments by email and, in the full-page format, the ability to collapse comments. Without these, the full-page format, which I’ve always had, became worse than useless and I had no option but to change to the embedded format. This has proved to be an unexpectedly positive move and I’m really enjoying the ability to reply directly to each comment, rather than having my response appear sometimes several comments below the one I’m replying to. It gives a much stronger feeling of commenting as conversation and is one of the functions I’ve always admired and envied in WordPress blogs. That bonus apart, I’m left with the time-consuming annoyance of having to go back to many of the blogs I comment on, in order to find and read the author’s response to my comment. I will do it, because I appreciate replies and don’t want to miss them, but I would so much rather be reading and writing new posts. Fingers crossed that the Google engineers will make it a priority to fix this, but I’m not holding my breath….